A Certain Magical Index started as a Japanese light novel series by Kazuma Kamachi. This popular franchise received several anime spinoffs, video games, and a manga series. Previously, the manga was unavailable to English speaking audiences. Fortunately, the US audience now has plenty of access to everything except the games. The basic story revolves around Touma Kamijou, a young high school student who lives in Academy City. The world in this series is similar to that of My Hero Academia in that magic or ‘abilities’ are the norm and the main character isn’t very talented… or lucky. After that the stories are quite different. The manga starts with a brief background on Academy City and our protagonist. It’s summer break and he has to take remedial classes because he hasn’t developed an ability acceptable for school. One classmate refers to his only ability as a natural disaster. Despite the unusualness of his ability, it actually becomes pretty useful later on in the story. Did I mention that Touma is also incredibly unlucky? He is. You’ll see. One day, Touma comes home to find a nun hanging off of the railing of his balcony like laundry left out to dry. She mutters, “I’m hungry” which is an awfully peculiar thought to have when you’re hanging like that. Voicing her hunger is the only thing she does until Touma drags her inside and feeds her. From there he learns that she is a nun with magical robes and he accidentally destroys them with his unlucky ability. The mysterious nun is named is Index and she has internalized a wealth of knowledge that a lot of dangerous people want to acquire for evil deeds. Index is actually on the run, trying to save herself from aggressive pursuers. Her encounter with Touma brings her a bunch of bad luck that he can only try to fix. I think Index is very cute – her mannerisms are childish in an enjoyable manner. She’s not annoying like a toddler; she just likes food… and magic. There are quite a few childlike adult women in this manga which is interesting to note since the women who are given young personalities and childish bodies are actually intelligent and capable while the younger women who appear older seem selfish and spiteful. 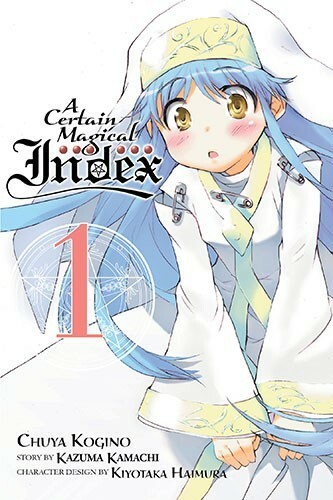 The first few chapters are a little slow at best but the volume really picks up when we meet Index. This is a fun manga to read and shows a lot of promise.